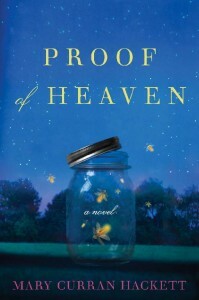 A boy with a rare heart condition, a single mom who will try anything to save him, a cynical but loving uncle, a doctor who has suffered his own personal tragedy: these are the four main characters in Mary Curran Hackett’s thought-provoking new novel Proof of Heaven. It’s a book with a fascinating premise: the little boy Colm has a rare condition in which his heart and his brain are at war with each other, which causes him to “die” at random moments before being resuscitated. This dying gives him a certain perspective on faith, one that is at odds with the beliefs of his mother Cathleen, who hangs onto the Catholic faith of her childhood as a way to find solace for herself and healing for her little boy. It’s a beautiful read; the plot (especially the ending) really made me think about spirituality, about what it means to believe in heaven and how exactly to define heaven in the first place. There’s a lot to chew on in this story, and I love how the characters each bring a different perspective to the big questions we all ponder. (I’ve also decided that I want a doctor like the fabulous Dr. Basu!). So it’s an honor to have the author Mary Curran Hackett here as a guest, sharing some fascinating insights about the experience of writing (and in some cases, living) the novel. Welcome, Mary, and congratulations on the new book! As you explain on your website, the story of Proof of Heaven was inspired in part by your own heart condition, as well as by a terrifying experience in which your infant son suddenly lost consciousness. What was it like to write about real-life experiences as fiction? I have always found it much safer to write fiction than nonfiction. I feel a bit more free to express my feelings, because I don’t have to worry whether or not I am remembering things perfectly or if I am causing some harm to another person whom I know and love by revealing too much. So whenever I need to process something I turn the real into the unreal and remove myself completely. Once I let my characters take over, I find it so liberating. I actually wrote the first chapter of my book, as somewhat of a purge, an exercise really. I didn’t even see it as a “chapter” of anything. I had no intention of writing a book. In fact it was entirely coincidental that I found the file several years later. Staying awake. I wrote the book in a two–week burst after an agent, who read what is now the first chapter, asked for the entire book. Only problem: I didn’t have an entire book. I knew I had to take advantage of a “yes” from an agent, and so I told her I needed a couple of weeks to “tidy up the manuscript.” (What I really needed to do was write the book.) Long story short: I worked every night for two weeks and wrote straight through 2 weekends. I also did it all with my children underfoot. I still had to drop them off and pick them up at school, go to work, make meals, move laundry––and everything in between you can imagine a mother needs to do on any given day. I also was working as an editor and teaching two classes at University of Cincinnati at the time too. My husband was super helpful though and stepped in every night at 6:30 after he arrived home from work. He cleaned up after dinner and helped with the kids’ homework and their nighttime routine. I wrote till dawn, slept a couple of hours, got up and went to work––and started all over again each night. I finished the book two weeks after I started it on October 31st, 2009, just a few minutes before I took the kids out to Trick–Or–Treat. (I promptly crashed sideways on my bed afterward and slept for 18 hours). I really love your descriptions of Assisi, home of St. Francis. Was that section based on a real pilgrimage? Thank you! I loved writing that chapter. Assisi made it easy. I just had to write what I saw. And magic just happens––because, well, it’s Assisi. I had traveled there several years ago for my job as a book editor for St. Anthony Messenger Press. The Province was kind enough to send me there to understand the Franciscan mission and history. Because I spend a lot of time editing books about Francis and Clare, I initially saw the trip less as a pilgrimage and more as a “research” trip for my daily work. But it turned into being so much more. I made wonderful friends, fell in love with Italy, and as it turns out, I came home with a lot of material for a novel I had not even known I would one day write. Faith is such a huge part of the book, and it’s something that so many of us struggle to understand and hold onto. If you had to share one thing that you know for sure about faith, what would you say? You know, I think this is a fascinating question. While I think faith is part of the book, I actually think it plays a small part. Funny? I know the title itself might lead people to think I am going to telling people what to believe, and perhaps some are hoping I prove heaven’s existence (or at the very least my proof matches up with theirs), but I had an entirely different objective and perspective. The characters all have different experiences and paths, and therefore different ideas about what faith, love, and life is or isn’t. To answer your question though: For me, the only thing I know for sure is that I know nothing. (Yes, I ripped that from Socrates. But it’s true.) That’s why I tend to say “I believe” and not “I know” when it comes to talking about faith. All I can say is I’m in it with the rest of the world––I am just wishing, hoping, praying and trying to do my best every day to be a good person and not mess up my kids (and the world) too much while I am trying to figure it all out. In the book, Cathleen’s faith is instilled in her by her mother, and Cathleen in turn tries to share that faith with her son. What’s one spiritual tradition that you learned from your mom and are now passing to your own kids? Oh, wow. My mom is big on tradition and spirituality. I am afraid I am a terrible protégé in that regard. She prayed the Rosary every day, went to Mass nearly as much. She also went through a stack of prayer cards before she even got out of bed in the morning. She worked for the church, and spent most evenings when she wasn’t with her eight kids at some church–related event. She also had more Jesus and Mary going on in our hallways and bedrooms than most modern churches do today. As a kid, I thought it was all a bit much. She was entitled to her devoutness though and that’s what worked for her, but it’s not something that works for me and my family. In fact I did try to put a statue of Mary in my bedroom and my husband thought it was a bit freaky (Full disclosure: the statue was encased in glass, lace–trimmed and gilded! He had a point. Needless to say, my mom took it off my hands last time she was in town.) While I don’t say the rosary with my kids, we always say a prayer together at dinner and we always talk about something going on in the world––just like my mom did with us. I love to hear what my kids are praying for, what they’re thinking about, what their doubts are, and how they’re learning how to be compassionate, grateful, and a part of the world that is so much bigger than them. For more information on Proof of Heaven, visit Mary’s website. As you know, I’m a huge fan of the saints, and I’m always eager for new ways to connect with them. 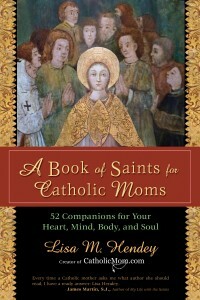 That’s why A Book of Saints for Catholic Moms by Lisa Hendey (founder of CatholicMom.com) is pretty much a dream come true. In the book, Lisa looks at fifty-two saints through the lens of motherhood, showing how each one can enrich the lives and spirituality of today’s moms. This is what makes this book so wonderfully different from the other saint stories I’ve read: it’s totally geared towards the spirituality of motherhood. I would never have thought that single guys like St. Patrick or St. Jerome could have direct relevance to my life of microwaving chicken dinos and tripping over toys, but Lisa’s marvelous book shows me that they do. (Her book has also introduced me to some pretty fabulous mom-saints I’d never heard of before.) At first, I’d intended to treat the book as a devotional (it can be used that way, meditating on one saint for every week of the year). Once I started, though, I was so captivated that I couldn’t stop; I kept reading and learning and getting inspired, which is what I’ve learned to expect from Lisa’s writing. (Over the last year and a half, I’ve had the pleasure of hanging out with her several times, and she’s just as engaging and wise in person as she is on paper). As if the book itself weren’t treat enough, I got to ask Lisa some questions about the saints, and I’m thrilled to share her answers here. Thanks for being my interviewee, Lisa — and enjoy the launch of your book! I can imagine a mom saying, “The saints were nothing like me … they lived hundreds of years ago, many of them in convents and monasteries, and didn’t have to juggle the demands of raising kids, running a household, and working outside the home at the same time. How can they possibly relate to my life?” What’s your response to this? I’d invite them to read the stories of amazing women like St. Elizabeth of Portugal and St. Margaret of Scotland, both royalty but also mothers concerned with the souls of their spouses and children and with living faith-filled lives themselves. I’d introduce them to St. Gianna Beretta Molla, a physician, and St. Margaret Clitherow, a businesswoman, both working mothers who faced many of the same challenges we face in our daily lives. And finally I’d point them to the Blessed Virgin Mary — the ultimate mom — who knew so many of the joys and sorrows we mothers face every day in raising our children. The saints were every bit “real” people who often stumbled along their paths to heaven, which is what makes their stories and their examples of faith even more compelling. Who is one saint whom you wish were more widely known? Why? There are so many “hidden” saints! One of my absolute favorites is St. Josephine Bakhita who was born in Darfur in 1869. Bakhita was kidnapped away from her wealthy family, enslaved, and ultimately taken to Venice, where she eventually found her freedom and a religious vocation. One of the reasons I so greatly love St. Josephine Bakhita was her ability to forgive her tormentors. So great was her love for the poor and the elderly that she served, that she actually gave thanks for the circumstances of her enslavement that led her to find her vocation. We all have things in our lives which “enslave” us — some face bigger challenges and addictions than others. St. Josephine Bakhita teaches me that in trying to live out the Beatitudes in my own life, I can find the path to grace and strength. If you had to explain the saints to someone who is not Catholic, what would you say? The saints are not “magic” or a superstition for Catholics. They are everyday people just like you and I who lived their lives in extraordinary ways, often against the most challenging of circumstances. Their choice to pursue lives of virtue, to seek Christ and to share him with others, often hold great relevance for the obstacles you and I face in our daily lives. Catholics look to saints as role models, and also as prayer intercessors — we don’t pray to them in the same way as we would pray to God. Rather, we ask for their “intercession” on our behalf, knowing that they are a part of the Communion of Saints. The same thing that made this book challenging also made it a great joy — the research! Learning intimately about the lives of fifty four people (two chapters feature husband and wife saints) is a daunting task. Historical documents on the lives of the saints are often in conflict, and there is a great deal of “tradition” and mythology that surrounds the accounts of many of the saints. In the end, I did my best to find the most consistent details about their lives. But more importantly, I chose to dwell on my own relationship with each of them, to share the personal aspects of my own friendships with them that make them a special part of my life. What’s one surprising thing you discovered in the course of writing this book? I mentioned it above, but I found it surprising how many “wives tales” there are about the saints. I also found it very surprising that so many of the more recent saints had such similar life circumstances to my own. I think it will be fascinating to watch in the next several years as saints who have lived in our times and even have been active in social media are canonized! Is there a particular saint with whom you’re developing a new relationship? 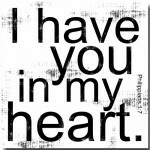 What is it about him/her that speaks to you at this point in your life? I’m the mom of two boys, just as you are. Are there any saints that you feel are particularly relevant to mothers of boys? I am perpetually in conversation with St. Monica, the mother of St. Augustine! St. Monica spent years praying for a son who was venturing down a very unholy path in his life. She never gave up hope that her son could find true faith and conversion, and in the end her trust in God was confirmed. St. Monica is a companion for me when I worry about my sons (which I do every day of my life) and her trusting perseverance reminds me that praying with and for my boys is probably the most important thing I do each day. Is there anything else you’d like to say about the saints, or motherhood, or faith in general? Ginny, I thank you for your hospitality in this wonderful place and for allowing me to share a few stories with your readers. I hope your family of readers will enjoy learning a bit more about the saints and that they will also consider A Book of Saints for Catholic Moms not only as a tool for their own spiritual renewal, but also as a way to pray with and for their families. 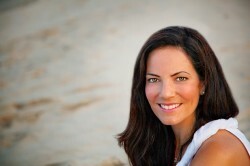 I also invite everyone to visit me over at www.CatholicMom.com, which is not just for Catholics or for moms! We have fun discussing topics related to faith and family and all are welcome! A Book of Saints for Catholic Moms is published by Ave Maria Press, who kindly sent me a copy of my own. 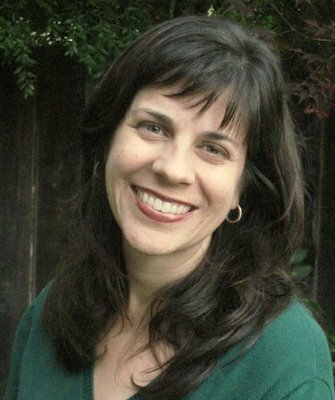 They also published Lisa’s terrific first book, The Handbook for Catholic Moms. When I started blogging three years ago, one of the very first people I connected with was Sarah Reinhard. And I have to say, there are few people in the blogosphere who are more supportive than this talented gal. Over the years, she’s been a great source of techie advice, spiritual inspiration, and online friendship. Read on for information about her new book, her life in the country, and her [well-justified] distaste for a certain winged creature. You’re a writer with many, many irons in the fire! Tell us a bit about your projects. My first writing love is my blog, SnoringScholar.com. It’s where I got started and where I keep my writer self rejuvinated, because it’s all fun. 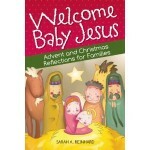 I’ve been working on a number of book projects in the last year, and the first of these is Welcome Baby Jesus: Advent and Christmas Reflections for Families. It’s available through Liguori or on Amazon. Parishes receive special discount and quantity pricing. It’s designed to help families EASILY observe the Advent season, with the goal of welcoming Baby Jesus at Christmas with a new wonder and appreciation for the Incarnation. What are three things that people should know about you? (any three!). 1. I’m a big Catholic geek. This means that yes, I have read the Catechism for fun and yes, I know what “transsubstantiation” means. 3. I hate wasps. Lucky for me, God sent us a new house and I can cross “finding wasps in the house on a daily basis” off of my “things to pray about” list. I’ve lived in urban or suburban places all my life. You live in a farmhouse, which to me sounds wonderfully evocative. Am I right to think that living “out in nature” is good for one’s spiritual life? Well, Ginny, the good news for me is that I no longer live in that old farmhouse that inspired so many of my, ahem, less joyful moments. (Ah, having to find a new topic for writing…but it’s worth it!) We only moved across the road, and we still own our farm property, so it’s been the best of all worlds for me. I find God so close to me in the cornfields that surround me and the animals grazing in pastures. I see him in the brilliant sunsets across the vista and in the bright colors of the changing seasons. I find myself growing close to Mary as I consider, while I hang out my clothes in the backyard, how she must have had a very hands-on life so many thousands of years ago. For me, the space of living in a rural area is refreshing. It gives me room to stretch my mental muscles. Incidentally, I also find that I have had to teach my kids that they have three voices: inside voices, outside-in-town voices, and outside-not-in-town voices. I met you through the blogosphere because we are both Big Mary Fans. What are some key words or images that you associate with her? Mama. That’s the biggest one. 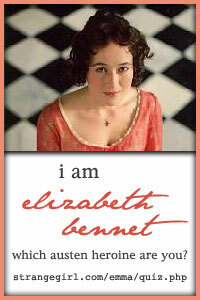 In that affectionate term, I find myself reminded that she was–and is–HUMAN, every bit as human as I am. She was a wife and mom who faced challenges. When my kids call ME “Mama,” I think of her, and I think of how, even as imperfect as I am, I can always look to her to help me, guide me, and love me. What is one thing busy moms can do to enrich their spiritual lives? As you do that which you hate the most, say a Hail Mary. Don’t stop what you’re doing, but imagine yourself standing beside Mama Mary, working alongside her as you would a favorite aunt or a good girlfriend. Have a conversation in the context of that prayer, and let her lead you closer to her Son. And then smile. Because there’s something spiritually enriching about smiling. For the last two years, I’ve been a BIG fan of Jennifer at Studio JRU. She’s an artist with vision, soul … and a whole lotta talent. I first got to know her when she did a series of photos honoring Mary (any friend of the BVM is a friend of mine!). 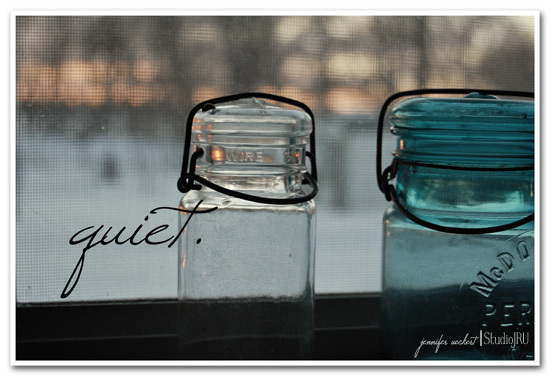 Her blog became one of my go-to places for serenity and peace: it’s chock-full of gorgeous photography and beautiful images of her art. After eyeing her art for quite a while, last summer I bought one of her woodblock pieces, which is right at home on my prayer desk. I love it — it keeps the word of God right in front of my eyes. So it’s a huge honor to welcome Jennifer to my blog, and to get a little window into her art and her creative life. She graciously let me share some of my favorite images from her collection; anything you like here you can find on her blog (and lots more besides). Enjoy! For someone who didn’t know you, how would you introduce yourself and your art? I would hope that my art is encouraging, inspiring and has meaning. 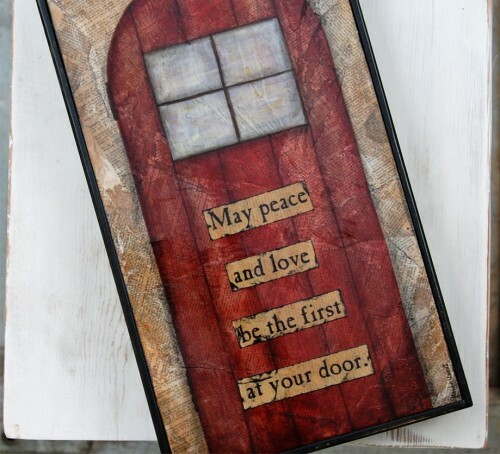 It is important to me that things in my home are meaningful, so I want my art to be that for someone as well. 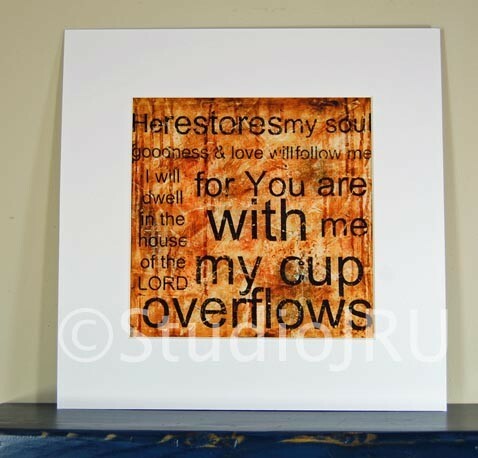 My art is about love and family and hope and God’s grace. I find His word peaceful and comforting. I hope others see that through the art. 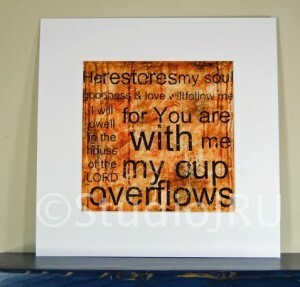 One reason I love your art is because it often incorporates text along with images. (I’m a huge word gal!). Are there certain Bible verses, or other sayings or quotes that are particularly meaningful to you? I love, love, love words too, Ginny! It is way too hard for me to chose a specific bible verse or other quote that is meaningful to me. Too many to pick from! Honestly, whenever I come across a verse or quote that makes me say, “Ohh… I love that!” I write it down. And that happens often. I have pieces of paper everywhere with a saying written on it for ‘later’ use. I divide my studio time between business and blog and my art. So there are days that I am doing more of the business end of things, like working on blog posts, responding to emails, paperwork… those sorts of things. Then are the fun days that I come up to my studio in the morning, make a fun mess with papers and paints all day, then go back downstairs in the evening. I am blessed that I can work from my home! What is the biggest joy (or joys) of doing what you do? The biggest joy is when I hear from people how much a piece of art meant to them. When you can touch the life of someone you never met… through a God given talent… it is just the best feeling ever. I will never tire of hearing how much someone loves to see God’s word everyday on a piece of art I made. Does Mary have any influence on your creative life, or on your life in general? I find Mary to be such a comfort in my life. Who would not love to have an ‘extra’ mother to comfort and love them? She is also such an inspiring woman. Brave and loving, compassionate and strong. Sometimes it can be scary to live the creative life. What would you say to a person who has the desire to create something (art, writing, music, etc.) but is afraid to start? To anyone who has the desire to create but is afraid I would say listen to that inner voice and just start. God has put it in your heart, so there is no need to be afraid. Your heart will thank you when you are able to let your creativity flow! If people want to know more about your art, where can they go? 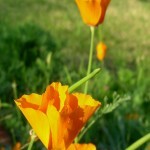 People can come to my (new) blog for more information about my art. I have links there for my shop, for my art in the DaySpring shop, and updated ‘news’ when I have new art coming out! All images copyright Studio JRU. And recently, Sarah interviewed me on her blog. She asked me many fascinating questions, including a question I’ve never been asked before (hint: it has to do with geography). Won’t you take a look? And be sure to check out her great posts while you’re there!